Display a favorite hanging item in a festive way using this Esschert Design Brown Cast Iron Pine Cone Christmas Stocking Hanger. This robust, cast iron hanger brings a natural hint to your mantel in moments, thanks to its detailed topper and brown tone. 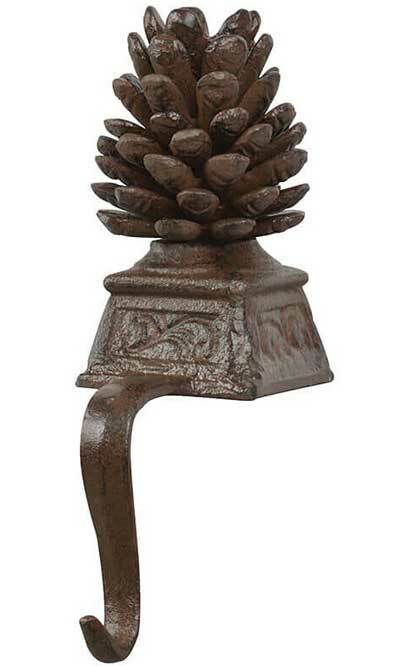 A three-dimensional pine cone forms the remarkable top of this piece, while a flared base creates a fantastic support. A hanging arm extends from this bottom section, and its upward curl holds a stocking or other adornment with ease. This base handily rests on a table or other level surface, and black hints throughout the brown finish offer an aged effect, enhanced by the cast iron construction. Showcase a hanging holiday adornment easily using this Brown Cast Iron Pine Cone Christmas Stocking Hanger.